In 2016, Brian K. Wyatt, Jr. decided to transition to be a full-time entrepreneur in Tallahassee, FL with his company B-EZ Graphix, a full-service marketing and design agency with a strong social focus. Brian is a business strategist and social innovator with over 14 years of experience in visual arts, finance, communications, website development, marketing, and project management and he is a United States Air Force Veteran. He believes that growing small businesses and having robust social impact will increase jobs and civic engagement in local communities. He believes that this in turn will decrease unemployment and solve many other social problems. This is the reason why Brian founded B-EZ Graphix in 2004 with a mission to help make marketing easy and affordable for small businesses and nonprofit organizations. Brian was born and raised on the South Side of Chicago, Illinois. So, he is no stranger to adversity. His entrepreneurial journey was no easier. During his Sophomore year at the University of Illinois at Urbana in 2004, his mother lost her job due to an economic crisis in his hometown. After losing financial support from his mother, Brian worked 3-4 part-time jobs to try to remain financially stable and help support his mother. Naturally, he was overstretched, and his grades suffered until he was academically dismissed from the University of Illinois in the Fall of 2004. Without access to the dorms, he was homeless for approximately 5 months living only off of the support of local friends. But, Brian resolved to stay put in Champaign, Illinois and went door-to-door to local businesses to offer his skills in graphic and web design to help promote and grow their businesses at affordable rates. The first client to offer him a contract became his good friend and was aware of the personal challenges that Brian faced. He remarked on Brian’s positive attitude, consistent professional appearance and commitment to excellence by saying, “after all you’ve been through, you make it look so easy.” From this, he earned the nickname, Brian “B-EZ” Wyatt, from which he named his company B-EZ Graphix. He combines his strategic marketing experience, leadership, artistic creativity and ingenuity with information technology applications to develop effective branding and marketing campaigns to achieve business objectives. His vision is to encourage aspiring entrepreneurs and “kidpreneurs” to know that they too can overcome the personal and professional challenges of entrepreneurship and be successful. 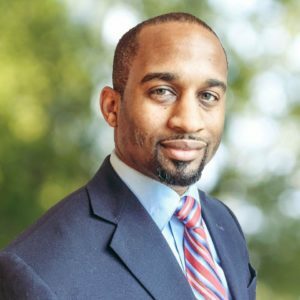 Mr. Wyatt holds a Bachelors of Arts degree from the University of Illinois at Urbana and is a graduate of the Jim Moran Institute for Global Entrepreneurship’s Small Business Executive Program (JMI SBEP), Class VII. He is currently a Master’s of Business Administration candidate of Keiser University. He is married to Sierra and they have 9 children between the ages of 1 – 14. Since moving to Tallahassee, you can find Brian cooking gourmet meals for his church and his family.